Youngsters Theology: Day 3 - "Farne Islands"
On the third day of our pilgrimage, the original plan was to go to Bamburgh Castle and hike into Sea Houses where we would have taken a boat out to explore the Farne Islands, which would have been dope. To prepare for this grand adventure we started off with a delicious breakfast at the Pilgrimage Famous Table Table. Naturally, we all ordered the Table Table. (For most of the nights we have stayed at the Premiere Inn. The restaurant that is attached to the Premiere Inn is called the Table Table. On the Table Table menu is an item called the Table Table Mixed Grill, which is literally a sample of the entire menu!) The breakfast Table Table gave you a list items and you can choose as many items from that list as possible. Most of us stuck to the classics; hasbrowns, eggs, bacon (which is not real bacon! ), and croissants! On this particular morning, Matthew ordered Black Pudding for EVERYONE and then made everyone try it. It wasn’t until afterwards that he told us what it is…pig intestine cooked in blood…. …gross. Anywho, back to the day. Unfortunately, due to the inclement weather we had to call an audible. 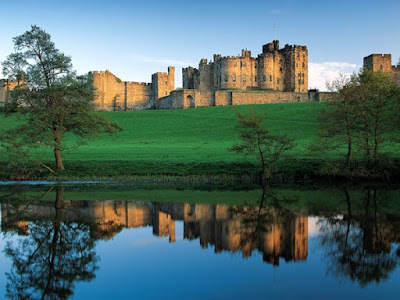 Instead we improvised and found the cool Hogwarts castle, Alnwick Castle. We were all able to separate by ourselves and do different activities around the castle. Turner beat Will in a head-to-head archery contest. Matthew and David “Robbin-hooded” the archery activity by shooting across the entire castle. Wesley, Baker, Stuart, Becket, and Olivia tried and succeeded in that cool thing that ninjas do in movies where they flip onto their feet from their back, which was sick. Evelyn, Steven, Mary Ashley, Ellie, Phillip, Bennett, Andrew, and Call witnessed Charlie and Henry shatter a chair and make an awkward scene in the courtyard (on accident). Claire, Lizzie, Anna, Allison, and Tess were chilling in the cafe. After a lit session of quidditch lessons where we were taught to mount broomsticks but were scolded for having worse conduct than the children in the same class, we all reunited again for lunch. Shortly after, we split into two groups, one going to the spooky “Lost Cellar” and the other to an awesome treehouse. On the second half of our day, we hopped off the bus and hiked to where we had a reflective Lectio on ruins up a sand mountain. It was incredible. After our Lectio on Mark 4:35-41, we walked for many miles in silence down the beach to reflect our talk about Jesus calming a storm and our faith in troublesome times. After our walk, we got on the bus and drove to the hotel and then went to an interesting Indian dinner. Everyone was perplexed by the food but it ended it up being alright. After dinner we decided to have our night service at McDonalds while we all ate McFlurries. Overall, day 3 was a very spiritual, memorable day that we all enjoyed! !